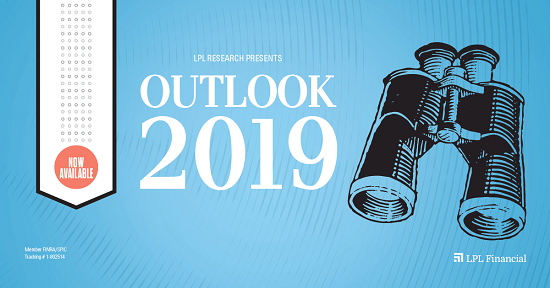 Taxes can take a big bite out of your total investment returns, so it's encouraging to know that your employer-sponsored retirement savings plan may offer a variety of tax benefits. 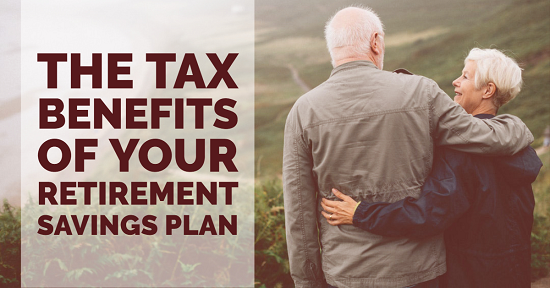 Depending on the type of plan your employer offers, you may be able to benefit from current tax savings; tax deferral on any investment returns you earn on the road to retirement; and possibly even tax-free income in retirement. When you contribute to a traditional retirement savings plan, such as a 401(k) or 403(b), your plan contributions are deducted from your pay before income taxes are assessed. These "pretax contributions" reduce your current taxable income, which in turn reduces the amount of income tax you pay to Uncle Sam each year that you participate. Consider the following example, which compares two different employees. instance, his gross pay would be reduced by $120 each pay period, resulting in a taxable income of $1,880. In this case, taxes would be about $451 — or $29 less than the previous scenario. 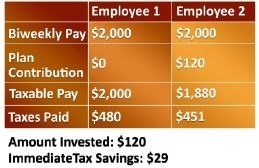 So Employee 2 would have invested $120 in a retirement savings plan and saved $29 in current income taxes. Keep in mind that this example is hypothetical and has been simplified for illustrative purposes only. Your actual situation will differ. Withdrawals would be taxed at then-current rates. Early withdrawals prior to age 59½ will be subject to a 10% penalty tax, unless an exception applies. Tax deferral is the process of delaying (but not necessarily eliminating) the payment of income taxes on returns you earn. Whereas in taxable investment accounts, you would have to pay taxes on your earnings — even if you reinvest them — in a tax-deferred account, you can delay paying taxes on your returns until you withdraw money. For example, the money you put into your employer-sponsored retirement account isn't taxed until you withdraw it, which might be 30 or 40 years down the road! Compounding means that your earnings become part of your investment dollars, and they in turn can potentially earn returns. In the early years of an investment, the benefit of compounding may not be that significant. But as the years go by, the long-term boost to your total return can be dramatic. Keep in mind that returns cannot be guaranteed. Your investments will fluctuate through the years. Also, withdrawals prior to age 59½ will be subject to a 10% penalty tax in addition to regular income taxes unless an exception applies. Let's assume two people have $5,000 to invest every year for a period of 30 years. One person invests in a tax-free account like a Roth 401(k) that earns 6% per year, and the other person invests in a taxable account (an investment account outside his or her retirement plan) that also earns 6% each year. 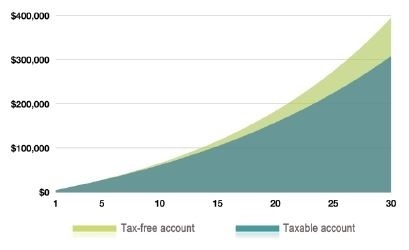 Assuming a tax rate of 24%, in 30 years the tax-free account will be worth $395,291, while the taxable account will be worth $308,155. That's a difference of $87,136. This hypothetical example is for illustrative purposes only, and its results are not representative of any specific investment or mix of investments. Actual results will vary. The taxable account balance assumes that earnings are taxed as ordinary income and does not reflect possible lower maximum tax rates on capital gains and dividends, as well as the tax treatment of investment losses, which would make the taxable investment return more favorable, there by reducing the difference in performance between the accounts shown. Investment fees and expenses have not been deducted. If they had been, the results would have been lower. You should consider your personal investment horizon and income tax brackets, both current and anticipated, when making an investment decision as these may further impact the results of the comparison. This illustration assumes a fixed annual rate of return; the rate of return on your actual investment portfolio will be different, and will vary over time, according to actual market performance. This is particularly true for long-term investments. It is important to note that investments offering the potential for higher rates of return also involve a higher degree of risk to principal. for those age 50 or older. If your plan offers a Roth option, you can split your contributions between the traditional and Roth plans, but the total amount cannot exceed these limits. Be sure to check your plan's documents as some plans may impose lower limits. Even if you cannot contribute the maximum amount, be sure to contribute what you can. Through the power of compounding, even small amounts have the potential to add up over time. Then, try to increase your contribution whenever possible — for example, as you receive raises or pay off debts. Your employer may also contribute to your plan account through matching or profit-sharing contributions. These contributions also benefit from tax deferral. In other words, you do not have to pay taxes on employer contributions or their earnings until you withdraw them. If your employer offers a matching contribution, try to contribute enough to receive the full amount. Employer matches are free money so try to take full advantage of them! Though tax considerations shouldn't be your only concern when investing for retirement, it's a plus to know that participating in your employer-sponsored plan can help you keep more money in your own pocket and put less in Uncle Sam's.